This page is for the 2002 game. For the 2018 game, see Hitman 2. The European release of the Hitman Collection is DRM-free, already patched to the latest version and have the cheats enable by default. The GOG.com version is patched to work better on modern operating systems and it's the uncensored version 1.01. Patch v1.01 is the latest patch available. English, French, and German versions of the patch are available. Maximum of 99 save files. Only 4:3 aspect ratio with maximum resolution of 1600 x 1200 supported by default. See Widescreen resolution. Up to 8x. Can make the game crash with 2x or more. Always enabled in fullscreen mode. High frame rate affects game logic and can also prevent certain levels from launching. See High frame rate issues. Some widescreen methods are reported to cause crashes at least on the Kirov Park Meeting level. Extract h2.7z or h2_enb.7z files to <path-to-game> (password=h2). Run upx.bat for GOG.com version of the game. Edit h2.ini to set the resolution and FOV multiplier. Works with Steam version (currently in beta, will launch with most but not all systems). Supported exe size: 2 838 528 bytes; 873 984 bytes. LOD distance and draw distance is also adjustable. Download the attachment (Hitman.2 - Widescreen-GOG.zip). Extract hitman2.exe and Hitman2.ini to <path-to-game>. Open the appropriate FOV folder and extract RenderD3D.dll to <path-to-game>. 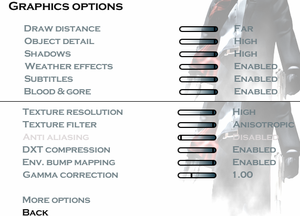 Edit Hitman2.ini and set the Resolution setting to the appropriate one. Not compatible with the Steam version. Add Window 1 to the file. Edit the Resolution line with the desired values. This fix decreases the vertical FOV in widescreen. Running the game in windowed mode disables v-sync and anti-aliasing. This can result in extremely high framerates that affect gameplay and break the in-game cutscenes. Running the game in OpenGL instead of Direct3D will cap the frame rate at 60 frames per second, but may result in graphical glitches such as untextured character models in some levels. May require DirectSound3D restoration software to restore proper sound functionality on Windows Vista and later. An AM3D "DieselPower" audio engine for the game is available here. Retail and here. Retail only translation available. 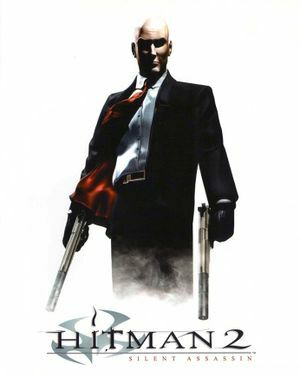 See Helix Mod: Hitman 2: Silent Assassin. Download the Hitman 2 Silent Assassin Windows 10 Patch. Unzip the files to <path-to-game>. Disable F5 Glove from the Game Configuration (config.exe). Set the Texture Filter to 'Bilinear' and Anti-Aliasing to 'Off' in the Graphics Options in the game if needed. The window is displayed in the middle of Windows workspace, which may end up being in-between screens. Disable the Full Screen setting. Click "Reset all settings" and click "Save and launch". Download the newest DX8 to DX9 convertor. Place it in a folder with the game. See Frame Rate (FPS) for instructions on how to limit the frame rate. Keep in mind, that this is DirectX 8 based game and some solutions may not work out of the box. Under the Graphics tab, check Fullscreen. This solution is not compatible with the first two widescreen solutions. This solution is compatible with the Vert- widescreen solution. The OpenGL renderer may cause some visual glitches, some graphical settings will also be missing. Frame rates above 60 fps will cause NPCs to be more sensitive than intended and may affect pathing timing. Game is still playable at 144 fps, but issues may arise if attempting to play through a level with perfect stealth. Very high frame rates will cause a "slow motion" effect in-game. Extremely high frame rate (above 1024 FPS) will freeze character movement and break in-game cutscenes, which can make it impossible to load the opening level. Framerate can be limited using Nvidia Inspector. 1.4 Support is buggy and incomplete. ↑ 2.0 2.1 File/folder structure within this directory reflects the path(s) listed for Windows and/or Steam game data (use Wine regedit to access Windows registry paths). Games with Steam Cloud support may store data in ~/.steam/steam/userdata/<user-id>/6850/ in addition to or instead of this directory. The app ID (6850) may differ in some cases. Treat backslashes as forward slashes. See the glossary page for details. Radio tower area is prone to crashing. Tested by with MSI Afterburner (required memory modification). This page was last edited on 26 January 2019, at 03:29.